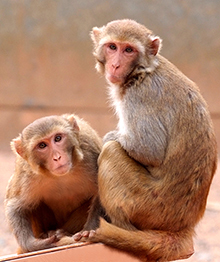 Emory psychologist Kim Wallen will lead a team that has received a $2.6 million grant from the National Institutes of Health to develop new technology to significantly enhance behavioral observation and data collection of rhesus monkeys. Wallen, Samuel Candler Dobbs Professor of Psychology and Behavioral Neuroendocrinology at Emory College of Arts and Sciences and a researcher at Emory's Yerkes National Primate Research Center, is partnering with Georgia Tech researchers on the project. Tucker Balch and Jim Rehg, faculty at Georgia Tech’s School of Interactive Computing, will serve as co-leads of the project. They are tasked with developing the new technology. Their creation will allow for simultaneous tracking of the location of more than 40 monkeys at the Yerkes Field Station by outfitting them with radio frequency identity tags (RFIDs) that will broadcast their movements in 3D to sensors located around the large, outdoor compound. The team will develop software that identifies affiliation patterns and specific behaviors, such as conflicts and mating from the collected location and velocity data. That information could then be made available to researchers around the globe for their own projects, such as those focused on the behavioral effects of experimental manipulations. The new technology will also help veterinary and animal care personnel monitor group health within the social colonies of research animals. The technology also may improve the safety of the animals, since it will enable detection of any unusual behavior. The project will be funded for four years, starting in July.